AMS 7347 Pendulum Wall Clock, in satinised mineral glass brass/gold coloured accesssories and highlights, designed with an undulating waved body, where the pendulum rod protrudes throught the body. 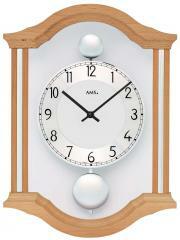 The clock face is analogue with black Arabic numerals and hands to match the chome finish of the pendulum. The clock is fitted with a quartz crystal movement, which is powered by an AA battery.